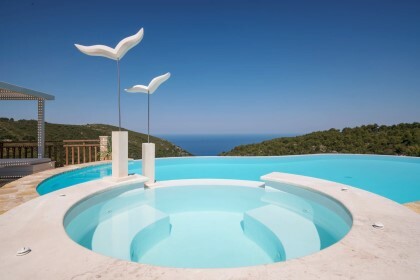 The brand new Amorosa Villas, the beloved, offer three luxurious and traditional residences inspired from the magic landscape of Lagopodo village in the center of the island, where they are situated. Our residences are located in a position of a marvelous view, they are designed in an original way respectful to the local environment and tradition and they also offer high-class services. 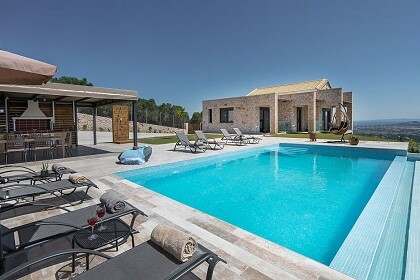 The vast verandah with the pool in the front part offers an unobstructed view over the lush plain of the island, the town of Zakynthos, Tsilivi bay in the north and Laganas bay in the south thus creating natural coolness in the summer and insulation during winter. The equally vast rear verandah seduces the visitor with its great view over the green slope of the village's mountain. The residences are ideal for those who dream of escaping in an area that seems to be part of a post card and offer generous and really unique hospitality all year long. 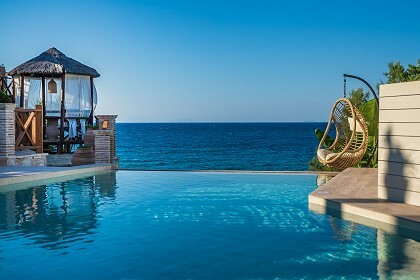 Let yourself live the experience and feel the aura of the Amorosa Villas, the "beloved". 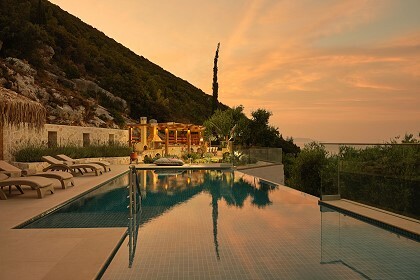 The three villas, Rosa, Azzura and Lila can accommodate 3-8 people. They are all decorated with traditional furniture and include air conditioning, plasma TV, CD, DVD, WiFi internet, safe box, hairdryer, iron and board games. A special highlight is the large veranda that offers a magnificent view of the beautiful surrounding Zakynthian countryside from each villa. There is a wide range of facilities and services offered like comfortable parking, a swimming pool with separate shower and deckchairs for each residence, everyday checking and cleaning of the pool and an alarm system in each residence. Villa Rosa and Villa Azzura offer a dishwasher and a Jacuzzi bath. There is also a sauna in Villa Rosa. The owners are always available and will cater to your every desire. 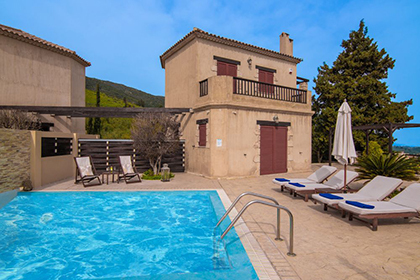 The Amorosa Villas are situated in the village of Lagopodo, an ideal location for hiking or cycling at a distance of 6km from the town of Zakynthos and the port and 5km from the airport. 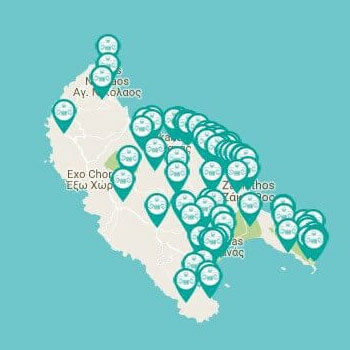 Some of the prettiest south beaches of the island and some of the most famous northern coasts (Keri, Marathia, Laganas, Kalamaki, Tsilivi, Limnionas, Porto Roxa, Navagio, etc.) can be found 5-9km away. Near the complex there are two traditional taverns with homemade food and local wine and less than a kilometer away, you can find the well known monastery of Panagia Eleftherotria and the beautiful Enetic style church of Agia Mavra with its bell tower, which is of unique architecture and rare acoustic.